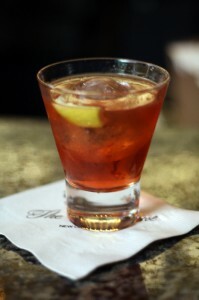 This classic cocktail get’s its name from a brand of Cognac, Sazerac de Forge et Fils, which was the original base ingredient. It also gained fame at the Sazerac Coffee House, opened in 1859, which was said to have gained it’s name from the cognac as well. Pour the absinthe into a chilled old fashioned glass, swirl the liquor around the glass until the glass is coated. Add the sugar, water and bitters and stir until the sugar is dissolved. Fill the glass with ice cubes, add the bourbon, stir well and add a twist of lemon.